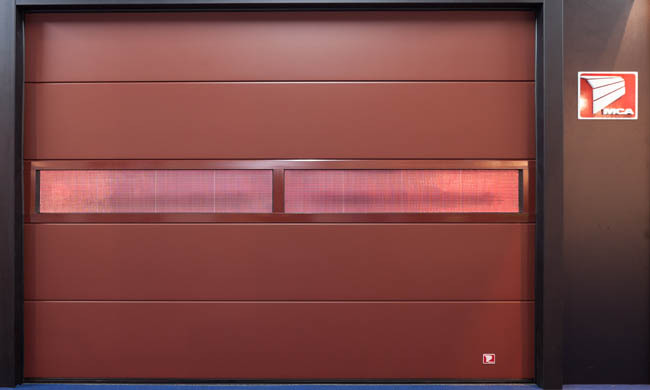 MCA Power Door is the ultimate garage door with photovoltaic cells. The prototype is built on a sectional door platform and can either work independently or can be connected to the building’s electric system. The system presented by MCA is formed by two OPV panels that capture the solar energy, made by a polymer that has the capacity of transforming the solar energy into electric power. The two OPV panels produce 30 Volts and 90 mA, having the possibility to completely charge the garage door’s battery in only 10 hours of solar exposure. With this amount of energy the door can make 30 cycles. Considering a medium operation of 4 cycles the system is designed to work continuously without other power source. After 4 hours of solar exposure, an OPV door can function for 20 minutes (approx. 10 cycles). For comparison, with the same amount of energy a laptop can work for two and a half hours and an ecological 8 W light bulb – for six hours. MCA’s Power Door project was started after a series of debates with a group of architects which aim to develop „Energy Plus Buildings”. This type of buildings are perfect for areas where connecting to conventional power sources is difficult, because they not only produce the amount of energy they need, but also can deliver the extra to the community. And as the garage door can occupy a large surface on a building’s façade, we can conclude that OPV technology will be one of the architects’ most common choices. Moreover, the solar energy captured by the garage doors can be used for charging electric vehicles. The energy coming from renewable sources represents only 9% of the global energy consumption, the objective being to reach a 16% target in 2020, according to The Energy Information Administration. Solar energy capturing was tested in Bell Laboratories in 1954, a priceless discovery due to the sun’s energetic potential: 100.000 terawatts per day. Only the energy emitted in an hour is enough to satisfy the annual global demand. Photovoltaic cells are of two types: crystalline silicate and organic film. The latter can be applied on almost every surface, being also much cheaper, only 80 dolars/ sq. m. As the National Renewable Energy Laboratory estimates, until 2014 OPV solar panels could cost 35 dolars / sq. m. Having in mind that garage doors can produce more energy than they need to function, the investment can easily be recovered in time. Organic film cells offer unlimited possibilities, as they can be applied on a large range of surfaces exposed to solar lightening, starting from car covers, umbrellas, tents, windows and doors and also on backpacks or decorative objects.